Now that Halloween is behind us and it is socially acceptable to post Thanksgiving recipes, let me tell you that I’ve been obsessing with Thanksgiving since early September. How could I not? It’s the ultimate foodie holiday where we can eat until our pants explode, without judgment – I hope – from our peers! If you’re anything like me, you already have your whole dinner planned. Turkey, stuffing, mashed potatoes, appetizers, cocktails and, the best part, the PIES! Nothing says Thanksgiving like a delicious Libby’s pumpkin pie. Even better if you make some maple whipped cream to go with it. Seriously, who could resist? Sometimes, after stuffing my face with turkey and everything else, I start to panic thinking I won’t have space for dessert. ? “I should have planned better!”. “I shouldn’t have gone for that third plate of turkey!”. But, I get a slice of pie anyway. As soon as the first forkful makes it to my mouth, I remember that my stomach has a separate compartment for dessert. And, just like that, life is good again and I can eat all the pie in the world. Please tell me you do the same! Do you also have a separate space for all things dessert in your stomach? You can tell me, I won’t tell anyone! ??? I usually make a few pumpkin pies before Thanksgiving. I like to practice so when the T day comes, I bring my A game with me. I still remember the first time I made a pumpkin pie, because it was only 5 years ago. 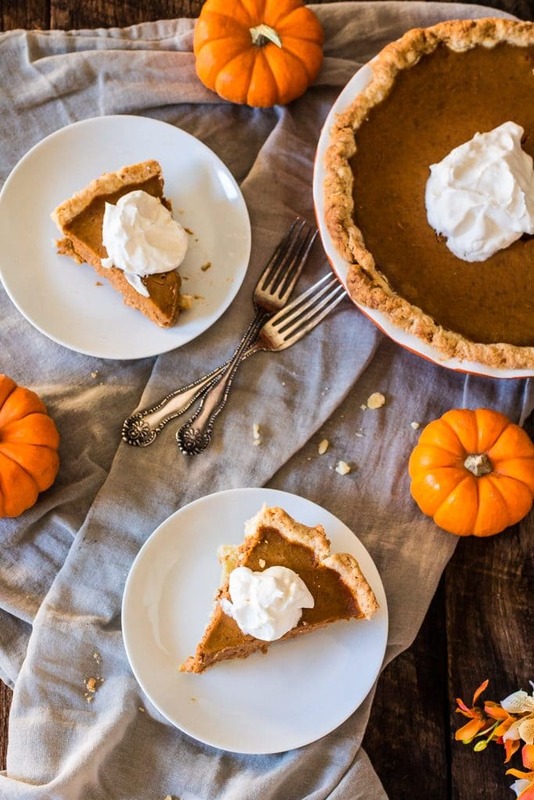 I was invited to a Thanksgiving dinner at some friends, and when I asked what I could bring, they said: “Oh, you can bring the pumpkin pie.” You see, at that time I was a newly arrived foreigner and had never even tasted an American pumpkin pie. ? But I’m not one to turn down a challenge, and instead of taking the easy way – which would be buy a pie – I decided to make it myself! Thanks to the internet, my pie came out pretty decent and I got to impress the people at that dinner. They kept asking me: “Did you really make this?”. I wasn’t sure if I should feel flattered or offended that they were surprised I could even cook. 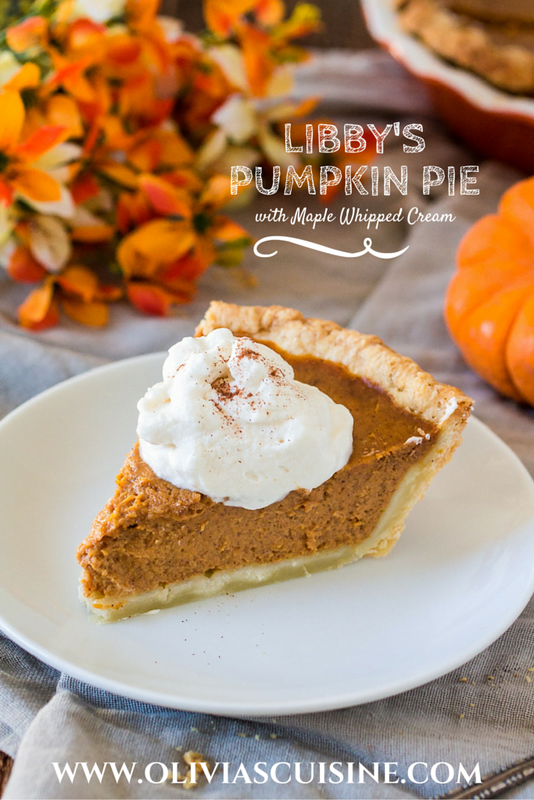 Fast forward to now and I’m still using the recipe I used that year, which is the Libby’s Pumpkin Pie recipe I’m sharing with you guys today. Ever since that night, I must have made 7 million different pumpkin pie recipes, but I always keep going back to the original. No matter what I did, it just wasn’t the same! I guess it took me a while to accept the fact that the best recipes don’t necessarily have to be the most complicated ones. 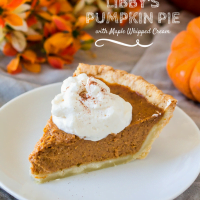 This pie is very easy to make and it is so delicious that it’s no wonder it has been on LIBBY’S® Pumpkin labels since 1950. The secret? Good quality ingredients. LIBBY’S® 100% Pure Pumpkin, 15oz is 100% natural and 100% pure. Made here in the U.S. and without any preservatives. 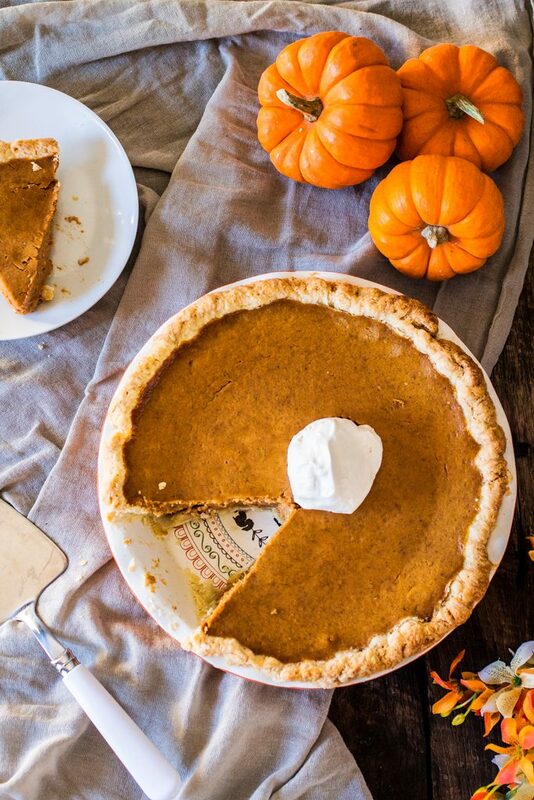 Add to that NESTLÉ® CARNATION® Evaporated Milk, 15oz and you’re guaranteed to have a creamy, rich pumpkin pie that will have your guests licking their plates clean. It’s the little difference that makes all the difference. And then there’s the Maple Whipped Cream. WHERE HAVE YOU BEEN ALL MY LIFE? I can’t begin to tell you how upset I am that maple syrup isn’t popular in Brazil. I am obsessed with that stuff! I use it in dessert, savory dishes, breakfast and, of course, in my whipped cream. Everybody knows that homemade whipped cream tastes better. What they do not know is that MAPLE homemade whipped cream tastes BEST. Especially over a delicious Libby’s Pumpkin Pie! 1 can LIBBY’S® 100% Pure Pumpkin, 15oz. Start by putting all your crust ingredients in the freezer for 10 minutes. You want everything to be super cold. Combine the flour, the sugar and the salt in a large bowl. Spread the butter cubes over surface and, using your fingers (or a pastry cutter), work the butter into the dry ingredients until the mixture resembles coarse sand. Sprinkle the cold water and work the dough just until it comes together into a ball. Form the ball into a disk, wrap in plastic and refrigerate for at least 2 hours before using. Roll out the chilled pie crust. Carefully place the dough into a 9-inch deep dish pie. Tuck it in, making sure the surface is smooth. Then, trim the extra overhang of crust and use to patch any mistakes! (No shame in that!) Crimp the edge with your fingers, prick the dough all over with a fork, and bring the pie shell to the fridge for another 10 minutes before using. In a large bowl, add the eggs and beat until smooth. Whisk in the pumpkin puree and the sugar/spice mixture. Slowly add the evaporated milk, vigorously whisk until everything is combined. Pour pumpkin pie filling into pie shell. Bake the pie in preheated oven for 15 minutes. Then, lower the temperature to 350F and bake for 40 to 50 minutes or until the center is almost set. If you think the edges of the crust are browning too quickly, cover with aluminum foil or piecrust shield after about 20 minutes. Cool on wire rack for 2 hours. Serve immediately or refrigerate for up to 3 days. With a hand mixer, beat the ingredients until stiff peak forms. Serve over your pumpkin pie! 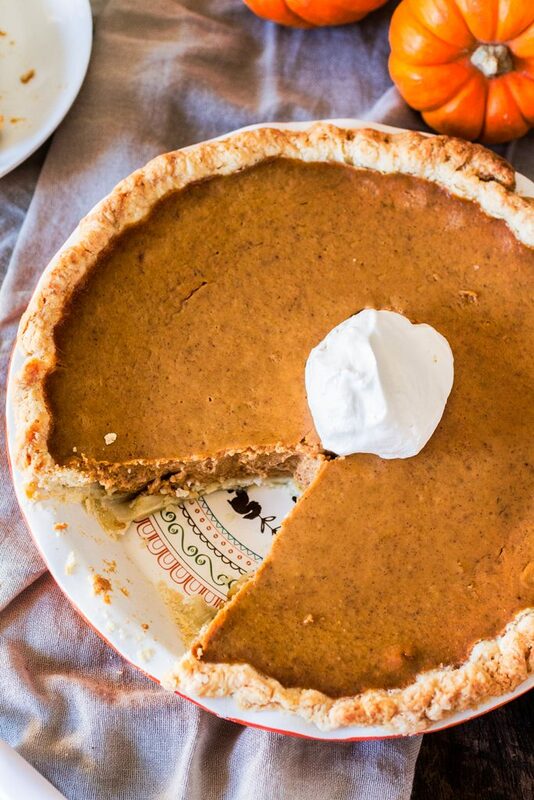 You can freeze your pumpkin pie for up to 3 months! Just thaw overnight in the fridge when ready to use. You can also make the filling the night before. The flavors will improve overnight and you won't have to worry about that on Thanksgiving day. Substitute the ground cinnamon, ground cloves and ground ginger for 3/4 teaspoon pumpkin pie spice, if you'd prefer. P.S. 2 Check out NESTLÉ® on Facebook, Pinterest and Instagram and stay up to date with all that deliciousness! P.S.4 Shopping at Walmart? I’ve got you covered! So, tell me, what is your favorite Thanksgiving food? This pie will be perfect for Thanksgiving Olivia! Looks amazing! Thanks, mira! I can’t wait for Thanksgiving! Yum! I use the recipe off of the back of the Libby’s can all the time. It’s such a good and reliable recipe. Looks like your pie turned out perfectly! I do keep meaning to try a pumpkin pie, I have only ever used pumpkin in savoury dishes, this looks great! I was just thinking that i want to make a pumpkin pie for thanksgiving! This looks perfect, Olivia!! Gorgeous! You can never go wrong with Libby’s for pumpkin pie. I love the addition of the maple whip cream! This maple whipped cream is gonna make me so popular on Thanksgiving! Great post! I love the Libby’s recipe, it’s a classic! Great recipe for pumpkin pie. I really like topping it with whipped cream.